Door Banners are a great way to sow your pride on PIR weekend. Also known as Navy Boot Camp Graduation. 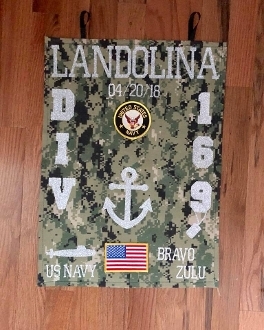 Hanging a banner or sign/poster on your hotel door has become a Navy Family Tradition. Your Sailor will love your sense of pride in him/her and all your friends from your online groups will love seeing all the banners as they walk down the Halls. The hotel door is a great place to show your pride since banners/sign/posters are not allowed in the ceremony Drill Hall. Be sure to choose which style you prefer. You can see the two styles in the picture Style one have one anchor and style two has two anchors. If you have two Sailors in different divisions and need two division numbers be sure and put the info in the note/special instructions section when placing the order. This sign is made from fabric available in differnt colors. I add your Sailors Last Name and DIV number. Other things can be added as well. I will add the dogtags and then you can choose which other embellishment to add. Choose are an aircraft carrier, a submarine, boots, a helicopter, or a jet. You can even add your own Navy themed embellishments to it if you prefer. You can get Navy themed embellishments in the scrapbook section of most craft stores. Be sure to include a phone number where you can be reached in case I have any questions.